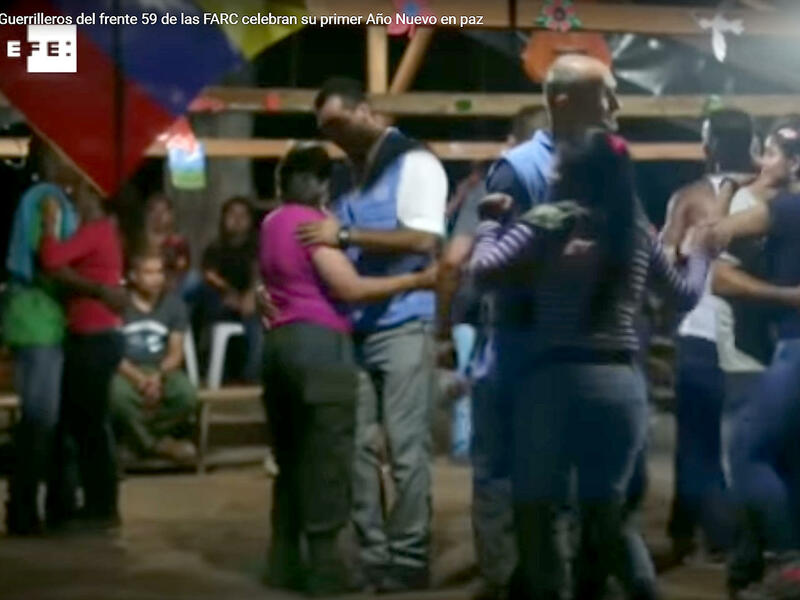 BOGOTA, Colombia -- United Nations observers are in hot water in Colombia over a video showing them dancing with leftist rebels while deployed to watch over the guerrillas as part of a peace deal. The short video was shot by Spanish news agency EFE from inside a jungle camp in northern Colombia during a New Year’s Eve party. It shows two men wearing blue vests with U.N. insignia dancing hip-to-hip with female guerrillas. The images, dismissed by some as a folkish display of Colombians’ love for revelry in even the most adverse circumstances, drew sharp rebuke from opponents of the peace deal between the government and the Revolutionary Armed Forces of Colombia. The U.N. mission in a statement late Monday said it would take appropriate measures. “This behavior is inappropriate and doesn’t reflect the values of professionalism and impartiality of the mission,” it said without identifying the officials by name or nationality. As part of a peace deal ratified last month hundreds of U.N.-sponsored observers, mostly from Latin American nations, are being deployed across the country to 20-plus camps where guerrillas will soon begin turning over their weapons. The U.N. mission is charged with receiving the weapons and providing periodic reports on the two sides’ adherence to the peace deal that seeks to bring to an end decades of bloody fighting.